What Are Head Lice And Pubic Lice? Lice are tiny insects that live and breed in body hair. They feed on blood from your skin and lay eggs daily (known as nits) that stick to your hair. The eggs then hatch in around seven days. Head lice are most common among children and are easily spread through head-to-head contact at schools or nurseries. You can also catch them from combs, hairbrushes, hats, scarves, bedding and chairs. It is a myth that headlice are a sign of poverty or poor hygiene. Pubic lice (commonly known as crabs) are usually passed on through sexual contact. They nest in pubic hair or occasionally in beards, moustaches, armpits or even eyebrows and eyelashes. Lice can make you itch terribly but they are more of an annoyance than anything else. In some cases the affected skin may become inflamed, which can lead to infection. There are various ways of dealing with lice. Unfortunately, the insects develop resistance to chemical treatments, which can limit their effectiveness. How Do I Know If I Have Head Or Pubic Lice? The first sign of a child with head lice is often persistent scratching. If you look carefully through your child's hair, close to the scalp, you should be able to see the lice moving around. They are flat, wingless insects, up to one-quarter of an inch long. You may also notice red patches or a rash on the scalp and tiny white specks attached to the hair. These are the lice eggs, which can easily be mistaken for dandruff or other skin complaints. 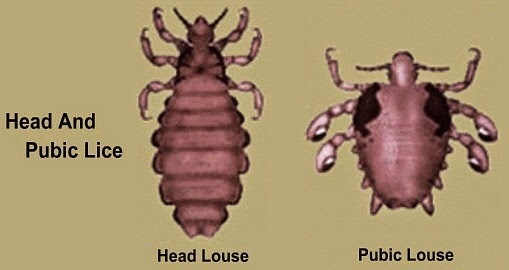 Pubic lice look basically the same as head lice. They are called crabs because of the crab-like claws with which they grip on to hair. What Can Do Immediately To Make My Head Or Pubic Lice Better? • Wash the affected hair regularly and use a special comb daily (a nit comb - you can buy this from your local pharmacy) to remove any live lice or eggs. It helps if you apply a conditioner first. • Ask you local pharmacist, doctor, practice nurse or health visitor about treatments for head lice. Most areas operate a 'rotational' policy, which means they recommend different products at different times to guard against resistance. • Some head lice treatments can also be used to get kill off pubic lice. You may want to get advice from your local sexual health clinic. • If one member of your family has head lice, check to see if anyone else is infested. What Can I Do Generally To Avoid Getting Head Or Pubic Lice? • If a member of your family or someone close to you has head lice, do not share their combs, hair-brushes, hats or scarves. • Disinfect combs and brushes in antiseptic solution. Wash clothes, towels and bedding, and have hats and other headgear dry-cleaned. • If your child has head lice, tell his or her school or nursery. • Avoid sexual contact if you have pubic lice. You will find lotions, cream rinses and shampoos for killing head lice, as well as standard nit combs and special electronic combs, at your local pharmacy. Ask the pharmacist which product is recommended under your area's rotational policy. After treatment, you will need to comb out any dead lice or eggs and disinfect the comb or rinse it in very hot water. You must follow the label instructions carefully when using head lice treatments. Some people are sensitive to the chemicals in these products and they can be harmful if they are over-used. If a treatment is not working, do not keep repeating it; use a conditioner and nit comb instead. When Do I Need To See A Doctor (Or Practice Nurse/Health Visitor)? • If the treatments recommended above do not get rid of the lice. • If a skin infection develops. • Lice are basically harmless but irritating and easily spread. • Use the wet combing method or, if that fails, ask about chemical treatments for lice. • Take steps to avoid passing on the lice - e.g., wash all combs, brushes, hats, etc. and do not let other people use them; avoid sexual contact.